A Czech version of our sister project weeklyOSM has now been online since the 14th of January, the Wochennotiz says. We are also now providing reports from French speaking communities, thanks to the French weeklyOSM edition. Battlegrid US is back again. User EdLoach (an Uber mapper!) writes about Addressing. On the “Tagging” mailing list you can find a thread about “Reverse Vending Machines”. User “Polyglot” works with a template on public transport routes in Belgium. They have published videos about the workflow. SteveA reported to the talk-us mailing list about his TIGER cleanup of track systems in California. Stefan Keller from Geometa Lab of HSR Hochschule Rapperswil (Switzerland) told us about the new web service TagFinder. Dmitry Kiselev designed a proposal AddrN, which expands the “Karlsruhe Schema” to addr2: = for the second and third address: = addr3. See also the two discussions on the tagging lists. Zverik summarises the most important questions and answers from Steve’s AMA on Reddit. On slashgeo you can read a Q & A with Steve. A new Flyer (to print). The community will present WinNav with OSM at the boat show “boot Düsseldorf 2015“. Read more about OpenSeaMap: geospatialworld.net. Paul Churchley suggested on the import list that data imported from the Open Charge Map (electric car charging stations) in OSM failed because of the incompatible licenses of the Open Charge Map (predominantly CC-BY-SA, some “third-party data imported under their own licenses”). See also the wiki page and the talk page. Clifford Snow announces a “community-import” of buildings and addresses in Kirkland, Washington, USA (West Coast). See also the Wiki page. Frederik expressed disappointment with imported mailing lists that were not discussed and poorly executed, citing Fresno as an example of this. OpenStreetMap US Inc. (the US Local Chapter of the OSMF) would like to be recognized by the IRS “Internal Revenue Service” as a non-profit (tax exempt) organisation. On the advice of a lawyer who advises the OSM-US board, they want to change the statute so that it conforms with the laws of Washington DC (headquarters of OSM-US (current statutes, new bylaws PDF)). By 20 January, the design can be discussed on talk-us. The OpenRailwayMap people are talking about a meeting in Essen in Germany. Stefan Keller reports on talk-ch, that the Swiss Postgres Conference will be held on June 25 and 26 at the University of Rapperswil. See: Call for Papers. On January 17, a mapping party with 24 participants took place in Yaou (Côte d’Ivoire). Because there are no aerial views they mapped with GPS, “old school!”. For their booth at the National Internet Week 2014, OSM contributors from Burkina Faso have received the gold medal in the category “Civil Society”. For Senegal and Tanzania, the first HOT tasks were launched for mapping African national parks and reserves. Cameroon high resolution aerial views are now available. Useful for HOT-Task # 777. Pascal Neis visualises the edits of the missing maps project (identified by #missingmaps in changeset comments). The Missing Map project seeks helpers as “Field Roster“. User eiridium reported the progress of the MapLesotho mapathon at Fingal County Hall (North of Dublin, Ireland). MapBox has integrated the 30m SRTM elevation data for Africa in its maps, recently released by NASA. According to NASA, South America, most of Europe and some islands in the eastern Pacific will follow. Paul Norman showcases a design for the new forest rendering in OSM-Carto (the map style used by OpenStreetMap’s “standard style”. O Tempo, a Brasilian journal, published an article about cultural spaces in Belo Horizonte. (via Gerald Weber). USAirways uses OSM maps to display the route your flight is on. There is currently an acute water shortage in the 20 million metropolis of São Paulo . The largest daily newspaper “Estadão” collects messages from their readers with the help of an OSM Map (another publication which does not credit this work properly!). “Estadão” has an excuse: the map was created using Livefyre. … but the community works. L’Équipe, the most popular sport newspaper in France, use OSM for their map of the UCI World Tour (cyclists classified by country of origin, race locations), via Éric Debeau. MapBox describe in their blog how they compensate small errors in the OSM road network by means of algorithms. 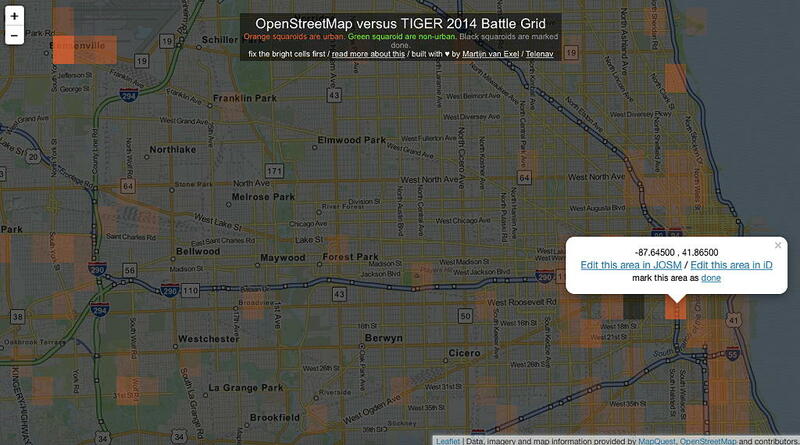 Two examples of maps with the JS library turf from Morgan Herlocker and Peter Liu. Severyn Kozak blogs about the new geocoder pelias and explains the installation. … Worst of OSM? … but a Best of OSM exists as well. … the two sites live.openstreetmap.fr and Show Me the Way, where OSM edits can be followed live. … the tool QA-feeds from Martin Raifer? Karrussel recalls the fact that you have to show the results of using Google Directions API on a Google map. Mapillary has a new logo. The Open Geospatial Consortium (OGC) has released version 1.0 of the IndoorGML (Indoor Geography Markup Language), via geoawesomeness. Cory Doctorow explains also why we need OpenStreetMap. Prosím, nešlo by udělat, aby se to v RSS objevilo až hotové, a ne jenom pahýl s “not available yet”? Momentalne bohuzel ne, ale muzeme k tomu zkusit WordPress dokopat.